FREE Munchies w/ Metrobank ~ Philippine Freebies, Promos, Contests and MORE! 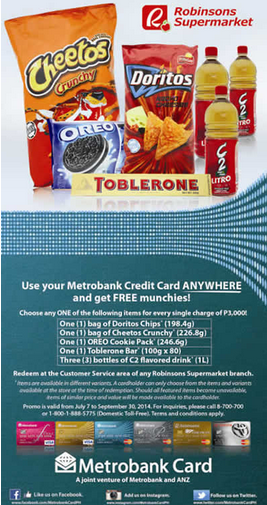 Get FREE munchies with your Metrobank card everytime you shop anywhere, any day. Swipe at least P3,000 and choose which snack you would like to claim: A bag of Doritos Chips (198.4 grams), 1 bag of Cheetos Crunchy (226.8 grams), 1 OREO Cookie Pack (246.6 grams), 1 Tobleron Bar (100g x 80), or 3 bottles of C2 flavored drink (1L). A valid transaction slip is equivalent to 1 redemption only. But you can make up to 2 redemptions per day per store. Simply present your card and surrender your charge slip transaction at the Customer Service area of any Robinsons Supermarket branch to get your freebie. Take note: You can only choose from the items and variants available at the store at the time of redemption.